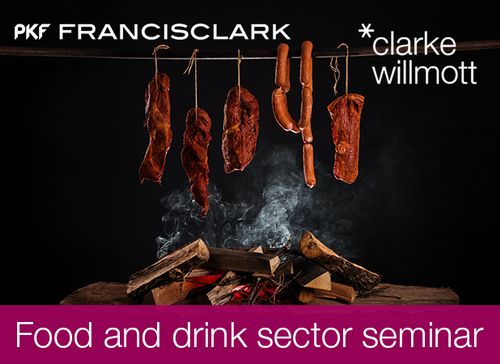 Clarke Willmott LLP and PKF Francis Clark are delighted to invite you to our 2019 Food and drink sector seminar on Thursday 28 February at Brown & Forrest. The South West’s food and drink businesses are vital to the region’s economic success but as with all sectors they face both opportunities and challenges. During this seminar you will hear from experts who can help you maximise the undoubted potential of your business. Research and development tax - what’s the fuss about? • What for the future? • Which funding option is right for you? Before the seminar there will be an opportunity to take a tour of the Brown & Forrest smokery, courtesy of proprietor Jesse Pattison, and afterwards you can enjoy a delicious slow cooked beef stew with crusty bread (vegetarian/vegan options available upon request. To book your place, please contact events@clarkewillmott.com with any dietary requirements.